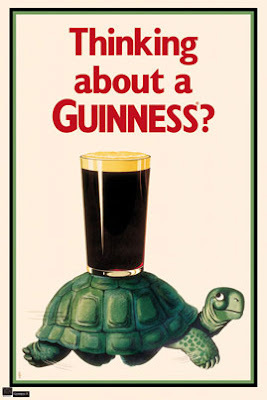 Century Cycles Blog: Guinness is good for you! We can't think of any better way to say "Happy St. Patrick's Day!" than to extol the virtues of Guinness Stout beer. GOOD FOR YOUR HEART! A scientist from the University of Wisconsin found that darker brews like Guinness had substantially more anti-clotting properties than light beers, preventing the clots that can cause heart attacks. The beneficial effect comes from hundreds of flavonoids in the beer, the same anti-oxidant compounds that provide the dark color in many fruits and vegetables. And don't stop at just one Guinness. The researcher said that for the optimal anti-clotting effect, you need to reach a blood alcohol level of 0.06, which for the typical person is accomplished with two, 12-ounce glasses. GOOD FOR YOUR WAISTLINE! Men's Health magazine reports: "Most people think of Guinness as a beer milkshake: dark, thick, and rich enough to induce tremors of guilt in thirsty partakers. But a 12-ounce serving is as low in calories as some watery light beer selections and can save you up to 75 calories over other full-flavored brews like Sierra Nevada Pale Ale. Part of that comes from the alcohol percentage: Guinness has 4 percent alcohol, and the Pale Ale has 6 percent. Switch out a six pack a week and you've just saved yourself nearly 7 pounds this year." I came across this blog where one poster claimed that Guinness contains enough of the basic essential nutrients (with the exception of vitamin C and calcium) that an average person could survive by drinking, per week: 1 pint milk, 1 pint orange juice, 42 pints Guinness. 7: The number of ounces of Bailey's Original Irish Cream you'd need to drink to replenish the 680 calories burned on a 1-hour, 18-mph road ride.